Here’s a running list of the shutdown’s effects in Maine based on coverage in the BDN and elsewhere. If we missed anything, let us know in the comments, and we’ll update this list. 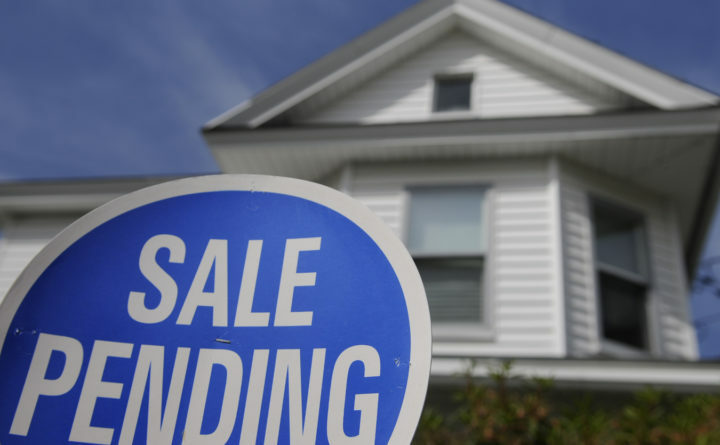 People depending on USDA-backed mortgages can’t close on their new homes. Featured in USA Today, Jordan and Tracey Smith of Madison couldn’t close on their new house without a commitment letter from the U.S. Department of Agriculture. They planned to use a rural mortgage loan backed by the federal agency. But the agency cannot produce its commitment letter while the government is shutdown. “We’re living out of boxes,” Jordan Smith told the newspaper. A sign in front of a 7-Eleven in New York announces that the convenience store accepts SNAP (Supplemental Nutrition Assistance Program), on October 20, 2012. 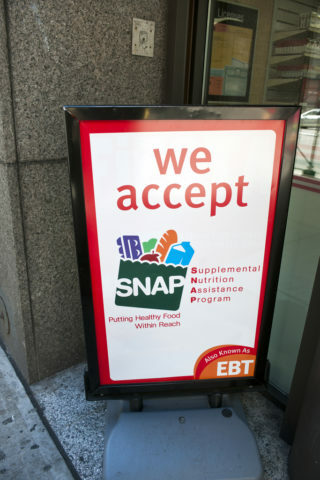 President Donald Trump has called for replacing half of the food stamp benefits received with a food delivery service tentatively called "America's Harvest Box." Food stamp recipients received their February benefits early, in case the shutdown continues. The 180,000 Maine residents who rely on the Supplemental Nutrition Assistance Program received their February benefits this month. The Mills administration decided to allocate the monthly benefits early in case the shutdown lasts beyond February, after federal SNAP funds are no longer available. In addition, federal employees are able to apply for SNAP benefits and for federal school lunch benefits for their children. Rental assistance for low-income households is at risk. More than 500 households depend on Section 8 Project-Based Rental Assistance contracts to pay their rent. Those contracts have been set to expire between December and February. Coast Guard members don’t know when they’ll see their next paycheck. 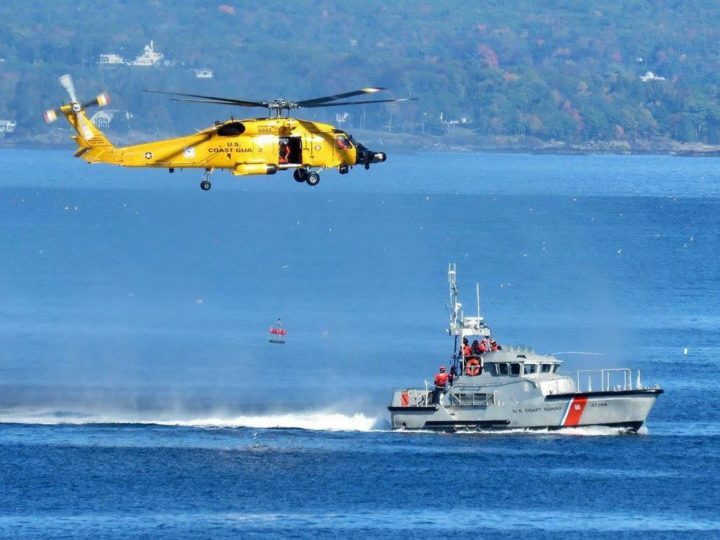 Nearly 600 active-duty, reserve and civilian personnel work for the U.S. Coast Guard in Sector Northern New England, most of them stationed in Maine. The active-duty personnel are working without pay. The Federal Aviation Authority’s restrictions on air traffic into and out of New York’s LaGuardia airport trickled down to Bangor and Portland. Air traffic controllers and Transportation Security Administration agents are among those working without pay, and the Federal Aviation Authority experienced staff shortages Friday, Jan. 25 at two East Coast air traffic control centers. Airlines reported major delays at LaGuardia airport, as well as other East Coast airports. Federal courts expect to run out of money by the end of January. The federal courts in Maine are expected to run out of money by the end of the month and start operating without funds on Feb. 4. Already, payments to attorneys who represent indigent criminal defendants have been suspended, and prosecutors in the U.S. attorney’s office have been working without pay. The courts still expect to process cases after they run out of money, but they will run with essential personnel only. 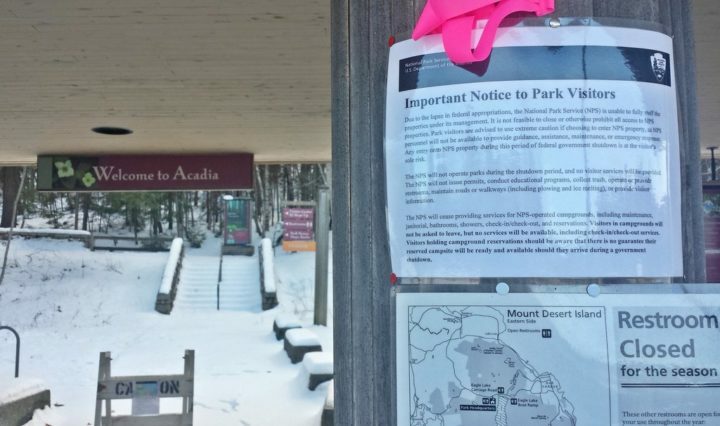 A notice publicizing the federal government shutdown is posted at the Acadia National Park Visitors Center in Bar Harbor on Sunday, Jan. 21, 2018, which usually is closed in winter. "Park visitors are advised to use extreme caution if choosing to enter NPS property, as NPS personnel will not be available to provide guidance, assistance, maintenance, or emergency response," it says in the notice. Maintenance and planning at Acadia National Park are taking a back seat. Plow drivers are among the park staff members who have been furloughed, and a reduced crew of rangers remain on duty. A nonprofit group, Friends of Acadia, says it has reached an agreement to allow volunteers to groom cross-country ski trails. The Small Business Administration isn’t processing loans. Small businesses in Maine and across the country depend on SBA 7(a) loans. But the federal agency is not processing the loans, and there is a growing backlog of small businesses awaiting their money. Maine, however, is among the states least affected by the halted loan processing. 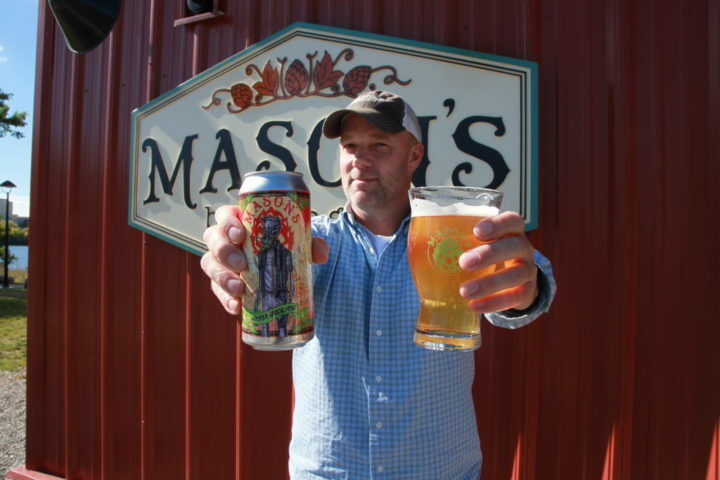 Mason's Brewing Co. owner Chris Morley holds his flagship beer, "Hipster Apocalypse," in this 2017 file photo. Morley said his brewery is awaiting federal approval on two new beer labels. Breweries may have to hold off on launching new brews. The federal bureau that approves labeling for every bottle or can of beer, cider, wine, spirit or other alcoholic beverage produced and sold in the United States is included in the shutdown. As long as it’s closed, it cannot approve any new labels for alcohol products. It cannot give the greenlight for new breweries to open, either. The CAT ferry operator can’t finalize arrangements to move to Bar Harbor. Bay Ferries needs to negotiate with U.S. Customs and Border Protection to determine the share of the agency’s costs it will cover at its new Bar Harbor terminal, where it plans to operate its Maine-to-Nova Scotia service. But with the federal government shut down, those negotiations cannot happen. With 2,700 workers’ salaries federally funded, Maine state government can operate through January. Most are unaffected by the shutdown and others look safe at least through January’s end. A spokesman for Gov. Janet Mills’ budget department said the state can operate through January without any impact on the state’s workforce, but things are more uncertain if the shutdown lasts into February. Other federal funding streams, such as Temporary Assistance for Needy Families, have stopped, but that hasn’t yet translated into suspended benefits for low-income families. Meanwhile, businesses are offering federal workers relief. Businesses, including cafes, a natural gas utility and banks, have stepped up in different ways to offer federal workers some relief while they miss out on their paychecks. Summit Natural Gas of Maine, for example, will waive late fees. A handful of restaurants are offering federal workers free meals. Some financial institutions are offering no- or low-interest loans and also waiving fees and penalties. A Hancock seafood business can’t reopen as it awaits its Food and Drug Administration license. The five employees at Sullivan Harbor Farm have been trained to meet federal standards for handling seafoods, and the business has been through a series of FDA inspections. According to owner Leslie Harlow, the last permit the business needs to reopen is sitting on an FDA inspector’s desk, waiting to be mailed out. Meanwhile, her five freshly trained employees are idled and looking into other work options. A farm that moved from Monmouth to Thomaston intended to use a government bridge loan. But the shutdown of the federal Farm Service Agency — which has reopened in a limited capacity — meant that the co-owners of Grace Pond Farm couldn’t complete the sale. The Farm Service Agency was the mortgage holder in this case, and the farm’s co-owners intended to rely on the agency for a bridge loan to pay for infrastructure on the new farm. Unable to complete the transaction or obtain the bridge loan, the farmers are holding onto two properties — and paying the requisite expenses — and they had to obtain a private bridge loan at an interest rate 5 percentage points higher. Portland Pie Co.’s new location in Lewiston is on hold. The developers working on the new pizza restaurant’s location have applied for a Historic Preservation Tax Credit, and made all the required arrangements, but the National Park Service needs to sign off on the second phase of the application, according to the Lewiston Sun Journal. The tax credit accounts for a third of the cost of developing the old fire substation into the pizza restaurant. Meanwhile, businesses are offering federal workers relief. Businesses, including restaurants, entertainment venues, a natural gas utility, banks, credit unions and more have stepped up in different ways to offer federal workers some relief while they miss out on their paychecks. Some restaurants are offering federal workers free or discounted meals, entertainment venues are offering discounted tickets, and some financial institutions are offering no- or low-interest loans and also waiving fees and penalties.